This is the only completely FENCED property for your privacy and security for little ones.Large paperbark trees and gardens add to the appeal of this cottage. 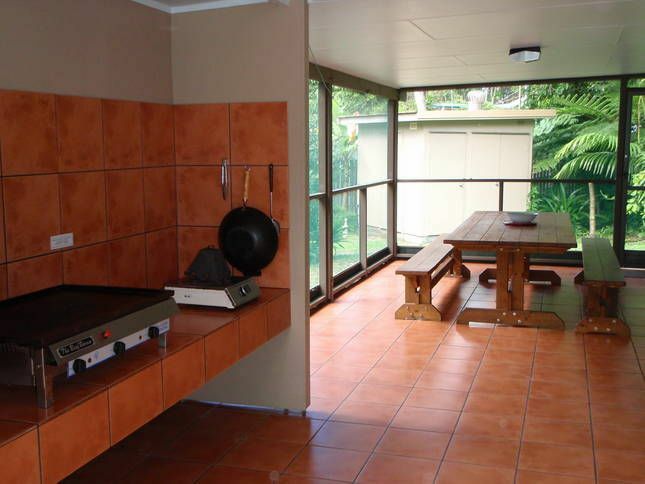 A wide veranda with excellent BBQ wok facilities makes for easy outdoor living. NO STAIRS. Three bedrooms contain two queen size beds one double and two sets of bunks accommodates from 2 to 10 people.Max 6 adults +4 children. Large lounge/dinning/kitchen area, two bathrooms, two toilets, gas stove and hot water, electric 520 litre fridge freezer, automatic washing machine, solar, 240w 24hour power. Fully insect screened , fans in bedrooms and insulated ceilings to keep you cool in summer.The cottage is thoroughly cleaned after each departure, as we live on the island we are able to clean and maintain the lawns and gardens to a high standard. Situated in Second Valley Eurong Beach only a short 200 metre stroll down the sand track to the beach, with restaurant, shop ,bakery and hotel a further 500 meters further along the beachfront .Easy access to all the popular lakes and rainforest areas even if the tide is high. Fraser Island is a World Heritage Listed Island with its endless beaches, crystal clear lakes and creeks, lush rainforest and much more to make your stay memorable. toilet, shower, Enclosed large garden hot shower , guests love it! If you have Telstra connection your mobile will work . no other service on the island. Internet from own device. Crockery, glasses and cutlery etc to suit 10 .
exploring, bush walking, 4wd, sand boarding , swimming in pristine lakes and creeks , beach fishing, rainforest, beach driving. Beautifully presented property, great location, great facilities. Made to feel at home by owners, very flexible and understanding. Accomodating, nothing is a problem. Accomodation was as described and very spacious, perfect for a family. Loved the outdoor shower and the small touches like Jills checklist before arrival. The cottage was well maintained felt clean and we had everything we needed. During our stay mid January it was humid and very little breeze so no fans in the living areas made it hot inside, but we understood this lack of fans is due to limited power supply. Wonderful holiday just uncomfortably hot at times. Thanks for a great base located centrally for day trips. Our two families had a lovely time at the beach cottage. The screened outdoor area is a perfect place to sit at night whilst playing cards and talking tall tails of the day. Our Kids loved the carpark area as an extra handball play area. The rooms are comfortable and had everything we needed. We were lucky with the weather as it wasn't too hot, so the fans running from 8pm to 4am suited us The kitchen is well stocked with cooking and serving items which made it easy. Thank you Jill for popping in and giving us some great ideas in where to go on the Island. Your tips saved us from a day of dissappointment. For any visitors please make sure to read the info Jill sends to bring. it is well thought out and makes sure you have everything for your stay to be comfortable. thanks Jill!! What a great,save place to relax with the children and come home to after a day out. Thank you Neville and Jill for sharing such a comfortable home base on a beautifull island. Awesome time. The house had everything we needed.